My review copy: ARC provided by the author in exchange for a fair and honest review. Della Sloane is not your average girl. Yearning to break free of her dark and sheltered past and the memories of the illness that claimed her mother, Della plans a solo road trip to experience real life on her own terms. But the trip is nearly cut short in the little beach town of Rosemary when she realizes she can't even pump her own gas--until Woods Kerrington shows up, more than willing to help out a pretty girl in need. Woods&#8217;s family wants him to settle down with a wealthy woman in pearls, but he can&#8217;t resist this carefree girl in cutoffs passing through town. A one-night stand should have been enough, but months later, Woods can't get the irresistible Della out of his head. When a twist of fate brings Della back to Woods, all signs point to trouble if they don&#8217;t keep their distance. Neither is truly free, and a relationship could destroy both of them. With their hearts on the line, Della thinks the safest bet is to walk away. But Woods isn't about to let that happen . . . I eased back onto her bed and she kept her hold on me. I let go long enough to pull the covers over us, then wrapped her up in my arms again and let my eyes close. She was okay. She was safe. "Don't cry. I can't stand to see you cry. I just want to make you happy." His words wrapped around my heart and I knew in that moment I had fallen in love with Woods. It might be stupid for me to love anyone, but I did. I loved him. I couldn't tell him, though. He did't know everything about me, and telling him I loved him was unfair. But I did. I loved him so much. Woods's hand reached over and covered mine, holding it firmly in his. He didn't look at me. His eyes stared straight ahead at the waves crashing on the shore. When his fingers threaded through mine, I let them. That simple touch was all I needed. Being here with him pushed back all the darkness. All the pain and sorrow was forgotten. I was okay. It felt good. I was a fan of the Too Far trilogy. I got pulled in with Fallen Too Far, came back again for Never Too Far, and ended up reading Forever Too Far. Overall, I enjoyed that trilogy even though it was a lot of repetitive drama. In that trilogy, I grew to heart Woods. He was nice to Blaire when she needed someone, and he was a good friend. I wanted to read his story and watch him get his happy ending, since he seemed to deserve one. Then I got Twisted Perfection. Started it forever ago--beginning of this year, I think? I'm not sure--but then I put it down because I found out something that would happen in the next book and it pissed me off. I had no idea when I'd pick this one back up. But then it was Christmas. I finished Wicked by JLA and needed something fluffy to bridge into whatever I'll read next. So I grabbed Twisted Perfection and finished it. Oh dear. This did not go anywhere near my expectations. And, unfortunately, that is not a good thing. 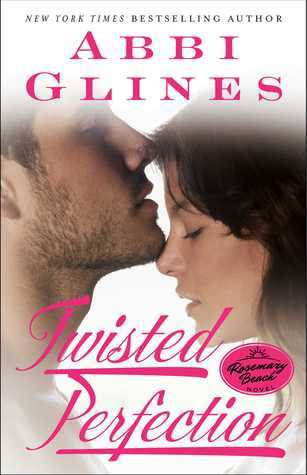 Right now I kind of feel like if you've read one or two--maybe three--Abbi Glines books, you've read them all. Pretty much the same stuff happens every time, but different details are used. There was Blaire: mom just died, dad absent but she wanted to go to him to help her anyway. Beautiful. Innocent. Now there's Della: mom died, dad not there (though this one for a much more sad reason), and she left to get away. Beautiful. Innocent. Their physical attributes are different and their backstories are not the same, but everything else? SAME. If I didn't know this was supposed to be Della, I'd think I'd missed a book and something traumatic happened to Blaire to give her weird flashbacks. Della and Blaire's voices are that coinciding. And then there's Woods and Rush, and I don't need to list out things for them. Only difference there? Rush's dad is a rockstar. Oh, and Woods has a family empire to lead. But their mannerisms and whatnot were the same. Twisted Perfection felt like another Blaire and Rush story. I highly enjoyed that couple. I would not have had a problem with another one--so long as it was actually a NEW one and not just the same thing regurgitated over and over. Love, hugs, kisses, Nan interferes, oh wait I love you most, repeat. It actually probably would have made an amazing book if Blaire HAD gone through something traumatic and then another book was written as the result. Interesting, fun, and not annoying. But this book is not that book. This is Woods and Della, however similar to the first couple they may be. And I did not like these two. Della was weak. And I don't mean because of her issues. I mean because she let Woods get away with so much crap. Where was her backbone? Woods was engaged. She knew this, and he was the one choosing to do things, and yet she still saw him as the victim. Woods was a GROWN MAN. There is no "I have no choice OMG I'll never be happy." He needed to stand up for himself. He didn't need pity and someone else to agree with his excuses. And Woods. It irked me how he didn't stand up for himself. It also annoyed me how he was engaged to Angelina, yet he kept on barking up the Della tree. Wishy washy to the core, this guy, and I got so irritated with it. Oh, and their friends! They KNEW Woods was engaged. They reminded him of this fact over and over. But still they updated him on all things Della. "I'm totally trying to get with her tonight, man. I know you'll be pissed, but whatever. She's worth it." "Whoa whoa whoa. You're engaged, Woods." "Tripp's coming back and I think it's for Della." Really. He's engaged. But they all did this. They told him things, he reacted, and then they were like "You're engaged, Woods, take a chill pill." WHY would they inform him of things, then? Why enable him to bark up that Della tree? It made no sense. So the first half of the romance grated on my nerves. When Woods was still playing puppet and with Angelina. After he broke it off with her, it got infinitely better, and I enjoyed the second half of the romance. I was skeptical since he knew virtually nothing about Della--they'd never really talked about much of anything--but their romance grew on me and made me swoon several times. The rest of the story wasn't bad. I got through it pretty quickly. It was just...typical Abbi Glines. If you love her, pick this one up. If you're on the fence with her and you've read the Too Far trilogy, it's probably best to skip. And if you hate her books, well... you already know. Now the question is: Will I read the sequel? Probably, yes. Because I read this one, and now I'm curious about their full story. And I know a certain THING is going to happen in the next one, and I know it's going to make me so angry, but I'd like to see how it happens. I want to hate that part for the right reasons. And who knows, maybe the book as a whole will work for me. Maybe Della and Woods will establish themselves. And their romance shouldn't be an issue for me anymore, since Woods already broke it off with Angelina. So yeah. I'll read the next one. Book by Abbi Glines have this way of making me devour them even when I'd most likely rather not. I've learned to live with it.